Nestled in stunning surroundings, Calabash Cove Resort & Spa has been hailed as a top romantic destination. You can enjoy a tranquil and relaxed atmosphere and let your mind, body and soul unwind as you embrace the island culture of St Lucia. Let the sand, sea and sun melt your worries and stresses away. The hillside location and the pristine stretch of beach simply radiates style and sophistication, making them ideal places for after-dinner walks or morning strolls with your sweetheart. There are few places in the Caribbean offering this level of secluded luxury – and you can enjoy it all from your own private porch or balcony. For the adventurous amongst you, there is plenty to do outside of the hotel, and the wonders of St Lucia are ripe for the picking – aerial tram rides enable you to sweep majestically over the rainforest, you can hike to the top of the soaring Piton Mountains, or even take a cruise on the Brig Unicorn – better known as the Black Pearl from the Pirates of the Caribbean movies. With all this and more, Calabash Cove truly has something for everyone! All of the beautifully-appointed rooms and suites at Calabash Cove feature spectacular views out across the Caribbean Sea, neighbouring Martinique and the island’s capital Castries. Natural resources and materials are prominent and all rooms have a king size bed, Jacuzzi style showers, mini bar, flat screen TV, internet access, air-conditioning, telephone and a private furnished patio or balcony. Most also feature a daybed and the cottages also have an outdoor shower, private pool and hammock. Sunset Oceanview Junior Suites – These luxurious suites sit facing west for spectacular sunset views. Offering ample living space, these rooms are located on the lower level of the Manor House overlooking the swimming pool and the resort gardens, with the sparkling blue Caribbean beyond. Swim-Up Junior Suites – Contemporary and stylish and with their own Jacuzzi, all just steps from the main swimming pool. You can walk into the waters and swim straight to the bar or maybe even a romantic midnight dip with just you and your loved one. Fabulously romantic and totally exclusive. They sleep up to 2 adults. Water’s Edge Cottages – Balinese-style cottages offering the utmost in privacy and elegance. They come complete with plunge pools, Jacuzzi, outdoor showers and a hammock to drift away in during the afternoon sun. Minutes from the shore, these are perfectly secluded by the tropical flora while still offering a brilliant vista across the bay. They sleep up to 2 adults. Dining at Calabash Cove is a wonderful thing, and the cuisine is highly regarded as being some of the best on the island. The signature restaurant is striving to become a Michelin level establishment, while delighting guests to a range of delicious and delicate cuisine, fine wines from the resort’s own cellars and a unique and elegant atmosphere in which to enjoy everything the island has to offer. Windsong Restaurant – This restaurant has soared in popularity of late and is fast becoming one of the top dining destinations on the island. Serving a range of international dishes with Asian influences, the emphasis is on fresh and locally-sourced ingredients. Open for breakfast, lunch and dinner daily, it offers diners breathtaking views out over the sea and is perfect for admiring the sunsets. C-Bar – Adjacent to the Windsong restaurant, this casually elegant bar is perfect for relaxing in the evening and you can enjoy a range of signature cocktails and fine wines during Blues hour, with live entertainment every night from 7pm too. 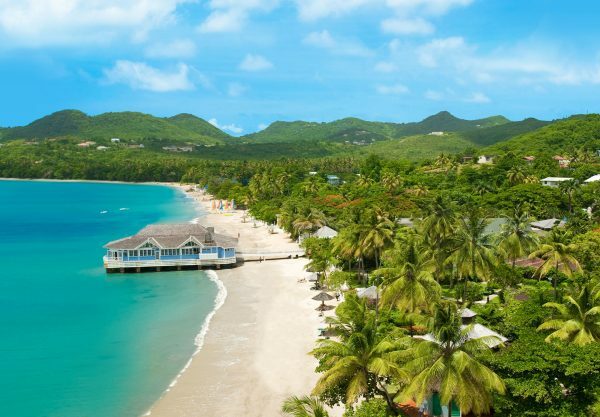 Calabash Cove prides itself as being an exclusive boutique resort, set in an amazing location on the island of St Lucia. There is plenty to see and do all around you, so take advantage of the wealth of tours and exclusions on offer. At the hotel the signature Sweetwater Pool is infinity style and has been elegantly designed to offer a cool and relaxing place to admire your surroundings while leaning over the edge. Surrounded by mahogany wooden loungers, you can enjoy a tasty cocktail from the swim-up bar or while you sunbathe in the warmth of the Caribbean. The dedicated Leisure Concierge team at the hotel are on hand to offer and organise a range of tailored excursions for you two enjoy. You can set sail on a chartered boat, enjoy a romantic picnic amongst the unspoilt and lush countryside, admire the stunning views over the island and beyond from a hike to the summit of the Pitons, or even fly high above it all on your very own helicopter tour. You can also embark on great snorkelling and scuba diving excursions, or try your hand at the new rage – snuba! Charters over to neighbouring Martinique are also possible, with cruise times at only 90 minutes you can easily turn this into a day trip away from the island and experience a whole new feel and culture before returning safely to St Lucia in the evening. There is also pony trekking, whale and dolphin watching, windsurfing, kayaking and deep sea fishing. For the golfers out there, the St Lucia Golf and Country Club is a short distance away and is an 18-hole championship course complete with a range of amenities. There are packages available at reception as well as equipment and show rental at the club. Tee times start around 7am. The on-site fitness centre is part of the lavish Ti Spa and is perfect for those wanting to burn off the extra calories you may have consumed at the Windsong Restaurant, or to keep up with your normal exercise regime. It features air-conditioning and a range of equipment coupled with stunning views. The spa at Calabash Cove is the perfect place to be at peace and rejuvenate the mind and soul. Treatments have eastern-influences and there are private rooms and highly-trained staff. There are massages, facials, wraps and more – you can even treat yourself to the salon for a manicure or a pedicure, or perhaps a spot of extra special makeup for that night out.